Recently I broke one of the moss green glasses that goes with my spring/summer tablescape that I always keep set between meals. I shared this with you long ago. "It feels odd still pursuing this as my daughter just lost her first house and almost all she owned in the 4-27-11 ravaging of northern Alabama by 240 tornadoes. 38 counties are disaster areas. We’ve worked so hard trying to salvage and dry out anything we could find in the sun as we had no power for a week. So many lost loved ones and many more lost homes like my daughter, and here I’m trying to replace one glass that broke so my table will be pretty again. Feels odd. I considered not pursuing it now, but as she stays with me till the insurance gets her in an apartment and as my other daughter drove in from WVA to help, my house became as much chaos as her property that we worked at from curfew to curfew each day, as much chaos as our state. Adding no power to it just made it worse. It just seemed to make such a dark statement to have that glass missing. You see, I have always kept the table set. We eat, I wash and reset it so it’s always cheerful and beautiful. One place for each of us in the family...and now as we sat, there was one glass missing. It’s as though it is the only thing noticeable about the table is that missing glass as if to remind us how close we have come to loosing my beloved daughter. As power returned and work at her house wound down and one daughter went back to WVA, I’ve tried to return my home to as close to “normal” as possible, because there is value in something being constant; something being the same when her whole world is gone. She has such a great attitude and I’m so proud of her and thankful to God for saving her life as she planned to be in her bed watching TV when it happened, and there was an enormous tree where the bed used to be and the entire back of the house, including her bedroom is gone. The table that was next to her bed was pushed through to the crawl space. Praise God that He kept her at work from 5 AM till 7:15 PM when the last tornado passed her house. 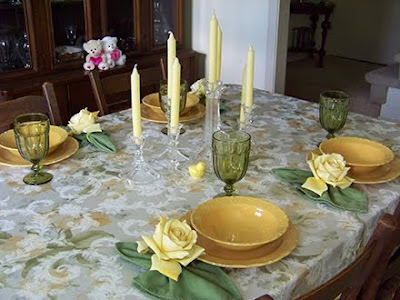 So, I feel very odd about pursuing this when so many have lost everything, but those four place settings have always signified my loved ones and even though the girls have grown and moved away, those place settings are always there waiting for them to bounce in the door and enjoy God’s blessings with us again. The new glass will signify that things have indeed changed, but they will mend and go on and all will be well again, even beautiful. I really hope you can find me another glass. Thanks for listening. I know it’s not your business to care, but this has been very large in our lives and as we wait for the insurance to get with it and start the healing, I just wanted you to know what one Libby glass means to my family. 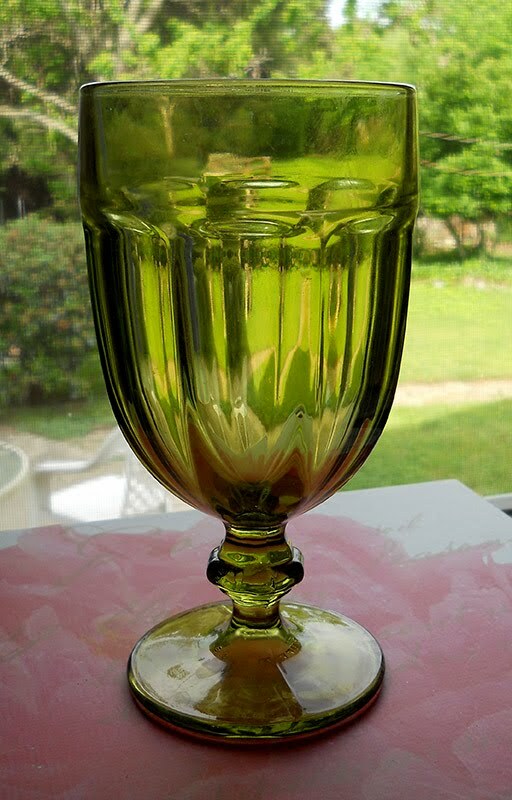 I discovered your glassware in Boaz, AL oh so long ago when the girls were very tiny and have kept them on my table ever since, different colors in a couple of styles, but always Libby glassware. You are part of what makes our home, part of every family gathering, part of every fond memory of happy times where we have been blessed to eat together. I hope this makes you happy when your job gets boring or stressful. You do actually make a difference in ways you probably can’t imagine." God sees the big picture so don't despair when your prayers aren't answered. He might just be saving your life! This has been quite a last two weeks here. You haven't noticed because I had worked ahead and had posts ready and automatically posting each day. On Wednesday, April 27th, 240 tornadoes ravaged northern Alabama. Thirty-eight counties have been declared disaster areas as of when I last heard. I've never lived through a day like that where all day and well into the night there were sirens every few moments, tornado sirens, emergency vehicle sirens, police sirens, you name it. I've also never heard of entire towns being wiped off the map, but now there are several near us. My oldest daughter, Ginger, works at Starbucks not far from my house. It's a tiny box almost entirely of glass and too tiny for there to be any actual safe place in it. Yes there's a freezer, but it's too small to really help. Twice during the day she saw wall clouds go right past/over the store and put everyone in the bathrooms. She had opened the store at 5 AM before we knew anything was coming. During the day the closer called and said she couldn't make it in. That meant Ginger was working till 9:30 PM. You might remember that Ginger is single and bought her first home last June. A former co-worker who lives near Ginger's house called and said there was no way to get to Ginger's house, the road was blocked at both ends with all manner of trees down and emergency vehicles and the storms weren't done yet. I took her some dinner as she'd been there all day and couldn't leave for a meal. There were several huge trees and a power pole down between my house and her store, just a couple of blocks. There was a large tree down at the church very close to her store. I asked her step-father to go by her area on his way home from work at 3:30 PM to see if he could get through and see if her house was ok. He couldn't even turn onto her road and police said no one could get through that night definitely and maybe longer. We lost power a little later and still they wouldn't let her close the store. It turned out that every trunk line bringing us power from TVA had been severed and all of north Alabama was without power. We didn't have a radio. We had one flash light, a couple of candles and a box of matches thanks to having them left from the seder meal!! Cell phones had almost no charge and barely worked at all for almost a week, of course land lines were out too. At 7:15 PM she was finally allowed to close the store. As she knew she couldn't get home, she came here for the night. As every bit of food in every frig and freezer in northern Alabama started to rot, we had one steak we split three ways cooked over what was almost the last of the propane in our grill (which only lasted to cook one more time). Subsequent eating got very interesting, but praise God we never lost water! The next morning we tried every approach possible and finally managed to get to her property with power lines over and under our car and trees everywhere. She had a very heavily treed lot with enormous trees so tall I can't say. As we neared her house all we could see was solid trees down in her yard, still twice the height of her house even on their sides. When we got out, we could find the front of the house and it looked ok except a few "light" branches on the roof...we thought. We walked around one side. I was taking pictures for insurance and she sat on a tree and looked up at her bedroom...the back half of the house and the deck were gone and it was solid trees. There was an immense tree where her bed used to be and it had many branches as wide as me...inside the house. In my human wisdom, I had prayed fervently all day that God would make them close the store so she could go home and be "safe". That's reasonable since her store is so utterly dangerous, a tiny glass box. Watch for God here and read on. Now is time to pause and reflect. I bombarded heaven all day to close the glass box store and let her go home where she'd be "safe". She was planning to crawl into bed and watch a movie on TV. She would have been in the bed that was no more, where the immense tree was. The little table next to it that my Daddy made when I was tiny was pushed right through the floor into the crawl space. Once we were able to get some information, we found out that every tornado in our area (at least 8) went directly over her house and the last one passed just shortly before the store was allowed to close, a half hour drive away. I have been so full of praise to God for protecting her that it only started to hit me this morning in worship what our reality would be today if God had granted me my constant, passionate prayers. In human wisdom, my prayers were right, but would have absolutely killed my precious daughter. God in His infinite wisdom and love protected her not only from the storm, but from her mother's love. Praise God for saying NO! Her house is destroyed and though we labored many days trying to dry salvaged things in the sun (no power for a week or more), there will be little salvageable. But she is fine and even her cats stayed in the wreckage till we could get to them the next day. She, as always, amazes me with her effortless perfect attitudes and behaviors. I am so grateful and so proud. Many have lost loved ones, homes and even jobs. The suffering is immense. It is the largest natural disaster in Alabama history they are saying. The first day was the hardest. Working as fast as we could to try to get things out as the remaining portion of roof was clearly coming down and I didn't know how long we had. It was so hot, no water, no food and worst of all, no cell coverage and dying batteries so we couldn't even let anyone know what had happened and get help. Trees so thick around the house it was very difficult to even get around the house. One of her trees had crushed a van in her neighbor's drive. We are told that three giant trees fell on/in her house. She does not have a wooded lot any more. God sent us help in the form of two young teens from next door. They were alone, unhurt and their home was untouched. Only the car was crushed. They were such a blessing helping Ginger and I get all but one room emptied into the garage (which was basically unharmed). God bless John & Tess. There are no words to thank them. And they helped despite very painful things in their lives just now. They helped us some on other days too and then helped other people. God bless them! Late in the afternoon Ginger's aunt and uncle showed up with her cousin and his wife. The men started on the trees. Her uncle heads the volunteer disaster relief crew at their Church of Christ and they travel the US helping when there are disasters. What a happy surprise to see them show up and more so as we were physically spent and sunburned. I have lots of health issues and had had hand surgery just a week earlier, so it was a huge challenge for me, but you know that Mama bears can do most anything for their cubs. Ginger's father came for a little while and was able to remove a few things from what had been her bedroom that we had given up on. They are knowledgeable on such things and pointed out how you could tell the tornadoes had lifted up immediately before her property. They pointed out that the entirely wooded lot next to hers had trees broken very low then right at her property line they are broken higher and higher. Had God not caused this to happen, there would have been no chance of salvaging any of her memories. There's a tree trunk in her yard broken even higher and the top (where branches were) is literally twisted off. A wonderful older neighbor, Ben, finished getting trees off his pasture fence and came over. He figured that we could tear through a remaining part of the living room wall and break into her closet to retrieve some clothes for her. I don't think many will really be ok, but it was such a blessing and I hadn't thought of breaking in from the other side. Ginger was able to contact her sister in West Virginia who then started her insurance claim for her on line. That was a blessing. But it was days before her agent could be contacted and now only today that an adjuster came and she is still waiting to be able to move into an apartment because of the insurance not doing right. The next morning as we arrived I was utterly stunned to see the property full of men with chain saws and big trucks with Mayfair Church of Christ Disaster Relief on them everywhere. They had come and started removing the trees and her aunt and cousin had gotten in the garage and started spreading things to dry in the sun again. I know they have done this for others, but it never crossed my mind they would come and help my daughter. Happy tears and praising God time again. All told they worked off and on for three days until they had removed all the trees they could before they were simply too large without cranes and such, and they tarped what was left. And such a marvel, they had food trucks that drove neighborhoods and two days we had food and water at lunch! Another day a kind neighbor, Carol (married to Ben) brought us lunch and wouldn't eat her own until we were done! Amazing people. After a few days, a couple from Good Shepherd Methodist Church came by and simply said, what do you need? They pulled the sofa, love seat and ruined (now stinking and bug attracting) carpet out to the road. Then they pulled appliances into her garage as they might still work. Amazing. The night of the second day, my youngest daughter, Melissa, arrived after buying supplies for us (as the power was still off and would be off for a long time) and driving 11 hrs. from West Virginia where she is to close on her first house on the 21st. She is always an amazing help and once there was no more we could do at Ginger's house, she went on and worked with the Mayfair team at other homes until she had to return home to work Saturday morning. God protected her too. Her aunt loaned her work boots and it was God that she did as that day she got a nail all the way through the heal poking through to irritate, but not injure her foot. Extra good as she has no health insurance. Thank you Lord! The Mayfair crew also cleared the trees from her neighbor's yard and got them off their now smooshed car before they moved on to other homes. They are still out working now, all volunteer. It's ironic...with two yards full of men in trees with chain saws and on the debris of the house, it was me, turning wet clothes spread on a felled tree to dry that fell hip deep into the hole left when the tree was uprooted and had to be pulled out! LOL kept a better eye out after that one! We have seen the best and the worst in people this last two weeks. We had strangers come help and we had a scam artist try to take advantage. He was even advertising on the radio!!! Praise God for revealing the scam to us so she wasn't further hurt. And we've experienced far worse than that I'm sad to say. But for every person who was inexcusably bad, there were many more who were good and kind. I was impressed by how well our big town did with dusk to dawn curfews and treating every stop as a 4-way stop for so long due to no power. People were cautious and polite. I'm so proud of our town! And the utility and emergency people are to be so highly praised! What a blessing. I've heard even some from other places came to help, but ironically, even though we were victims and lived through it, without power we have missed all coverage and I know little about the big picture. Finally today the insurance adjuster came. It was not good news. It needs to be bulldozed and rebuilt from scratch, but you have to know that the insurance companies are trying to cut every corner as they are being hit with such numbers of claims. He said they will "repair". We need a structural engineer to look at it to protect her. Please keep Ginger in your prayers for a good resolution. She's also had quite a nightmare trying to get into an apartment in the mean time. The insurance company is overwhelmed I know, so we give them grace, but man are they not doing well and not doing right by her so far. Please keep Alabama in your prayers as so very many are suffering so much worse than we are. Aside from how God saved my precious daughter, my favorite story, was told by the Grandmother herself to one of the Mayfair workers who told us. She was alone with three grandchildren, a baby, a young child and an 8 yr. old I think. When the mother came home, a neighbor ran out and told her not to go up there, that they were all dead. She said of course she had to go up there. She saw the four of them standing and staring at all that was left of the house, a hallway, leaning. That is where they had been. One child asked where the man was? Mom said there was no man. The other child said yes there was, that he had laid over them and told them not to be afraid, that they would be all right. Again she said there was no man. The boy said, "It was GOD dummy!" Praise You Lord forever more! Please keep my daughter and all of north Alabama in your prayers. Now for your freebie! Since I don't have time to make a new freebie just now, I have gathered all the Emerald Isle pieces that I gave you one at a time into one download. If you missed any pieces or didn't snag it earlier, now's the time! Enjoy! 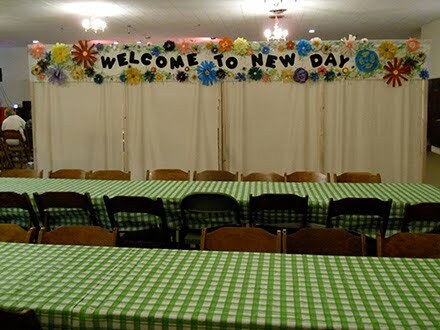 It's time to change our very large welcome banner in the fellowship area at church to a spring/summer theme. Pastor Ken and I have been working hard (and spending a fortune) planning a very special event for April 22nd as a community outreach. We are having a night of teaching about the Passover as it reveals Jesus Christ to us. We are going to have the Passover/Seder dinner along with the teaching so that everyone can experience this amazing insight that every Christian should have. You'll never see the Lord's Supper/Communion the same! Given that we hope to have lots of visitors, I wanted the new welcome banner to be very bright and cheerful - flowers seemed the thing for spring and summer. I didn't want to paint again. 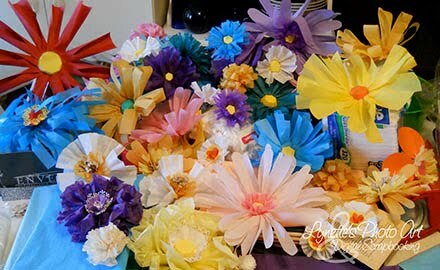 It just didn't see special enough, so I've been designing and making all manner of paper flowers - 27 different blossoms in all. My table was a mountain of lovely blossoms - so happy to look at and that's not even all of them! I thought you might like to know how to make some of them, so for 27 days I'll be posting a tutorial for one of these lovely blossoms! I have given this template out once before, so if you got it then, you don't need to download today. 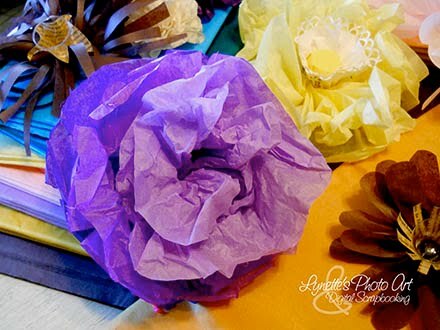 I saw the most beautiful paper roses at Paper Studio and just had to try them for myself. There is a fabulous video tutorial at http://paperstudioink.blogspot.com/2010/10/tuesday-tutorial-making-paper-flowers.html. They used one of those expensive machines to cut their shapes out, but I don't have one, so...I needed to make myself a template. 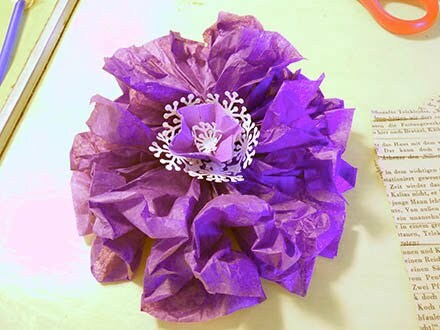 I created the shape and then since I had no idea how large her flowers were, I made it in six different sizes from 2"-4.5". She curled the petals on a wooden skewer. I didn't have one, so I curled mine over a thin screw driver. She used some wonderful fast drying glue. I didn't have it, so I used a very thin layer of low melt glue and it worked fine. I made sure to curl the glued petals immediately after gluing before it hardened. I didn't have 2-sided paper, or that intriguing finishing spray she used, but I think my first three roses turned out pretty well! Enough to make me want to keep practicing!!! 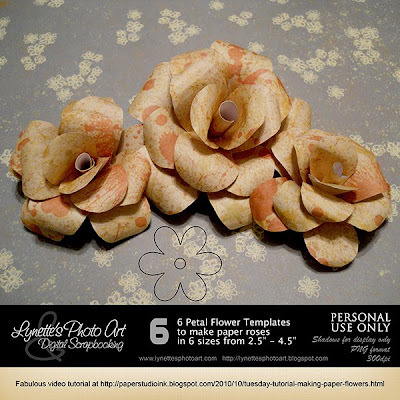 So, the good news for you is that since I made all those different size templates, I'm going to give them to all of you who don't have fancy cutting machines either! 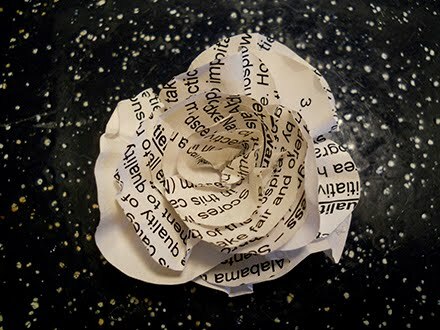 So, enjoy and fill the world with lovely paper roses! I would love to see your creations and share them with everyone here! A big thank you to the ladies at Paper Studio for bringing this to my attention - now we can all make these little beauties! 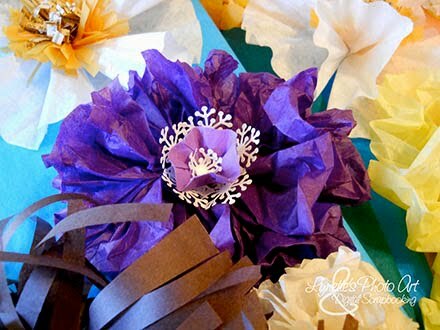 A nd this brings our 27 days of paper flower tutorials to an end. I hope you have enjoyed them! 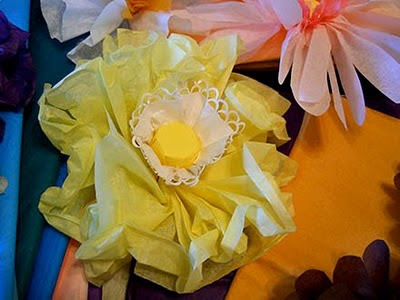 This lovely flower starts with two widths of tissue paper half the width you want your flower to be. 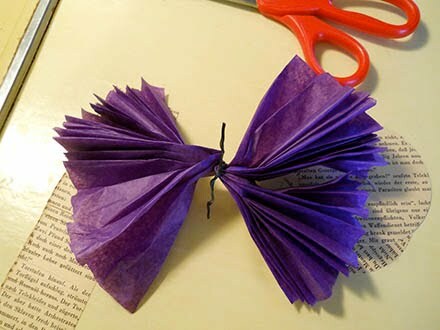 Accordion fold both lengths. 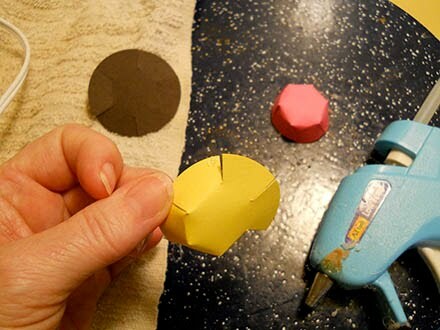 Bunch both together and cut a tiny slit on each side. Pinch in the center and secure with a twister tie.. Run your fingers along the outer edge, spreading the folds open. 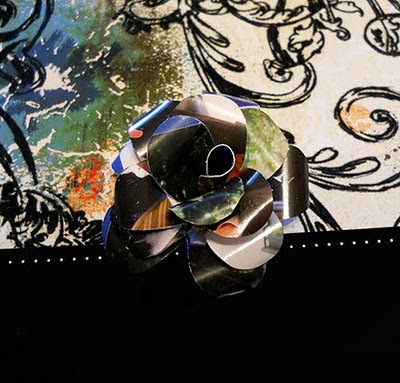 The edge will curl up around your thumb as you go. 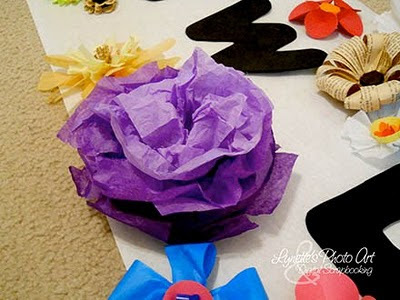 Do this to all outer edges and arrange to look full and pretty. 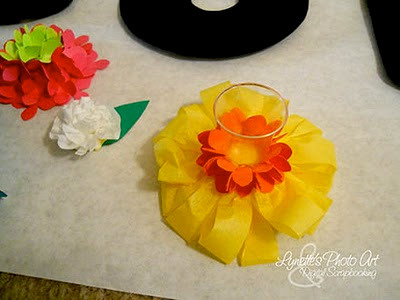 It will look like this when all outer edges are fluffed. 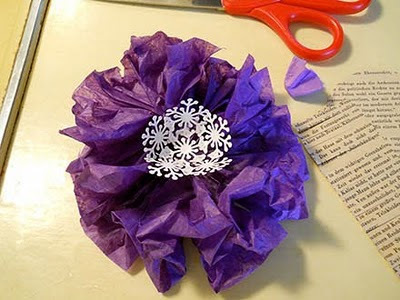 Next I used Martha Stewart's snowflake punch. 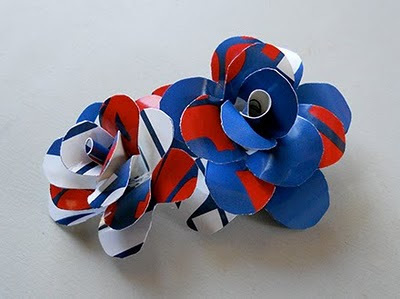 I connected six of them with dots of glue to make a cup shape and glued it in the center of the flower. 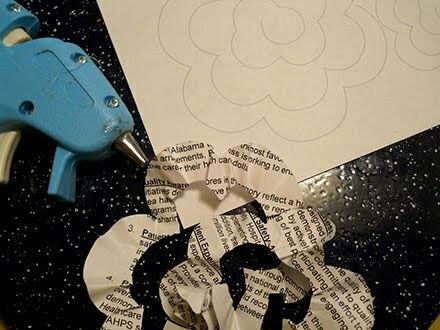 Now you'll want to make the center of paper. Take a circle of paper. Cut six slits from the edge of the circle toward the center. Put a dot of low melt glue on the right edge corner of a section and stick the left edge corner of the section to it's right on top of it. 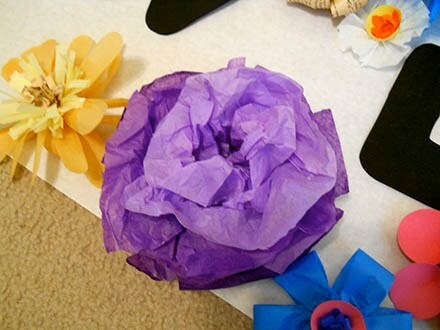 Work your way around the circle to form the center of the flower. If you want a small center, make your slits longer toward the center. 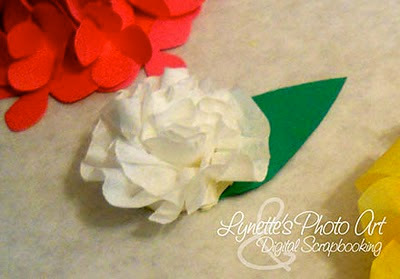 If you want a wider center, make smaller slits toward the center. 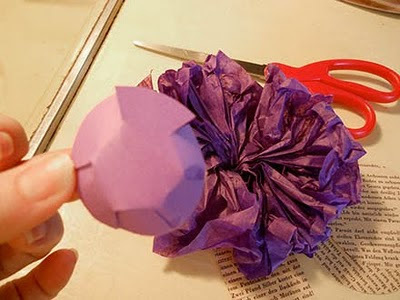 Next take the little cup and crush it bending it into a five pointed shape like below and glue in center of the snowflake cup. I have given this template out once before, so if you got it then, you don't need to download today. 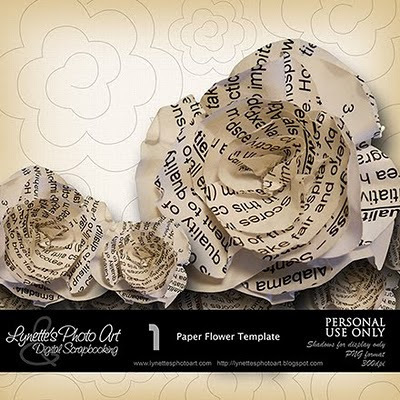 I have drawn this template which prints on a regular size sheet of paper and will give you seven flowers of different sizes. 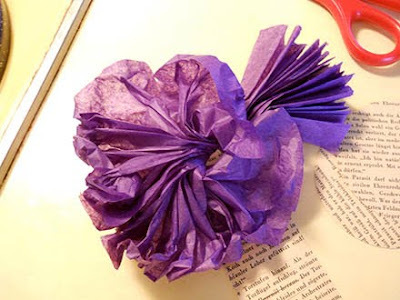 Cut these out and then sort of gather them as you coil them into a splendid flower. 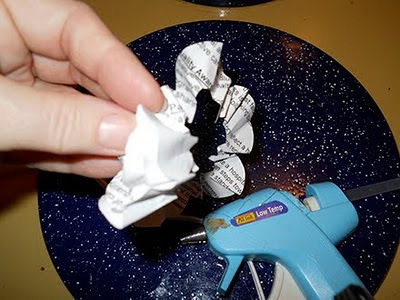 For all of you who just don't seem to have the knack (like me), here's how I do it. 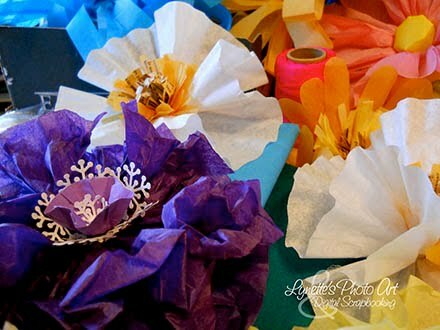 This big beauty is so easy! Just cut lengths of 3 shades of the same color of tissue paper half as wide as you want your flower to be. Run a large basting stitch along the bottom edge of each of these. I used a medium thick cording to do this as I think thread would cut through the paper. 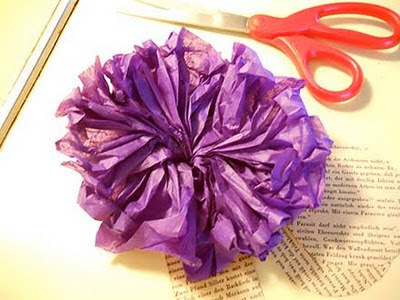 Then gentle gather the paper up along the cord, winding the paper into a tight spiral until it forms a multi-layered full blossom like you see below. Tie the ends together, fluff to your linking and it's done! To make this lovely little carnation, take a small white coffee filter and trim about an inch off the ruffly top all the way around. If you need to make the flower more full, cut another strip off the ruffled part of the filter and add it on. 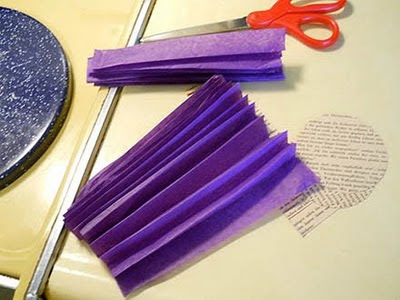 All you do is finger pinch the bottom edge of the strip of coffee filter and start bunching it tightly together to make a core. 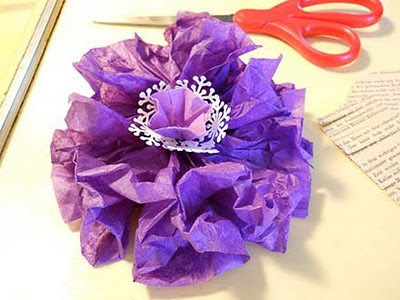 You can either just secure it with low melt glue on the bottom as you finger gather and wrap the strip around and around itself or you can cut a small piece of paper and glue it to it as a base. Voila! A tiny treasure! 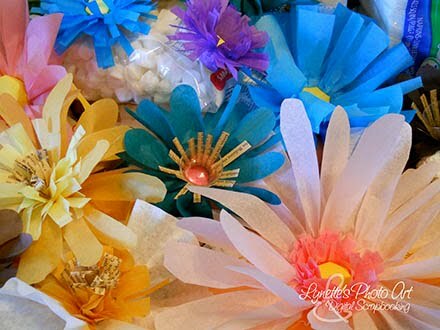 For variety, you can tint your filters with tea, paint or ink and let dry before you assemble your flowers.